The total solar eclipse of Aug. 21, 2017, is only three months away. Are you ready? Three months from today (May 21), a shadow of darkness will travel across the United States in the middle of the day. The portion of the country that falls under this shadow will experience a total solar eclipse, an incredible phenomenon that occurs when the moon completely covers the disk of the sun. Here are just a few of the things you'll need to know as you count down to this rare experience. On Aug. 21, 2017, the total solar eclipse will be visible along a 70-mile-wide (113 kilometers) band stretching from Oregon to South Carolina. The region where the moon completely covers the sun — called the "path of totality" — will pass through Idaho, Wyoming, Nebraska, Kansas, Missouri, Illinois, Kentucky, Tennessee, Georgia, North Carolina and South Carolina. Observers in the U.S. (including in Alaska and Hawaii) positioned outside of this band will be able to see a partial solar eclipse. The partial eclipse will also be visible from the rest of North America, Central America and part of South America. On average, a partial solar eclipse occurs somewhere on the Earth between two to five times a year. During a partial eclipse, the moon blocks only part of the sun's disk, appearing to take a bite out of the star as seen from Earth. A total solar eclipse is rarer, happening approximately once every 18 months. A diamond ring is one of the phenomena that occurs in the last few seconds before totality during a total solar eclipse. The duration of this summer's total eclipse will depend on your location, but at most, it will last for 2 minutes and 40 seconds. This will happen along the center of the path of totality. REMEMBER: Looking directly at the sun, even when it is partially covered by the moon, can cause serious eye damage or blindness. NEVER look at a partial solar eclipse without proper eye protection. See our complete safety guide to find out how to view the eclipse safely. 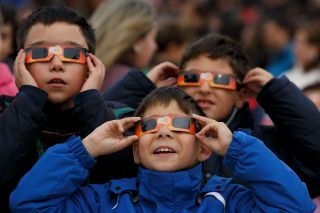 Skywatchers planning to observe the eclipse should obtain eclipse glasses; even multiple pairs of sunglasses will not be strong enough to protect your eyes. People using telescopes should obtain solar filters. Once the moon has completely blocked the disk of the sun, however, observers can view the hidden atmosphere of the sun with the naked eye. Be sure to read our complete guide on safely viewing a total solar eclipse to avoid damaging your eyes. During the eclipse, observers will experience twilight conditions at midday. Because of the rapid darkening during such an event, animals have been known to become confused, with birds halting their songs and cows sometimes heading back to the barn, according to Rick Fienberg, press officer for the American Astronomical Society and an eclipse aficionado. Temperatures can drop 10 or more degrees as the sunlight disapears, Fienberg told Space.com, and Mercury and Venus, often hidden behind the sun in the daytime, can become visible, as can some of the brighter stars. The sun's atmosphere, typically invisible to skywatchers on Earth, becomes visible during a total solar eclipse. Shown here is an image created by various NASA probes, which use special equipment to study the sun's extreme atmosphere. As the moon edges between the Earth and the sun, hidden features of the solar atmosphere can also become visible. The sun's magnetic field controls the star's atmosphere, so the gas surrounding the sun is shaped into jets, ribbons and loops created by the magnetic field lines. This region of the atmosphere, called the corona, is usually obscured by the sun's brighter body, but during the eclipse, as the light from the heart of the sun is covered, skywatchers can catch a glimpse of this and other atmospheric features. During the last few seconds before the moon entirely covers disk of the sun, the thinning crescent of light will break up into a series of small dots that look like beads on a string. These features, known as Baily's beads, are named for the British astronomer Francis Baily who discovered them. When only one bead remains, paired with the circular band of light created by the layer of the sun's atmosphere, it can look like a diamond ring. Some NASA representatives predict that Aug. 21, 2017, may be one of the worst traffic days in history. Although roughly 12 million people live within the band of totality, approximately 25 million reside within a day's drive of it. NASA predicts that the population inside the path may double on eclipse day. Make sure to plan extra time for travel, so you can focus your time and energy on enjoying the spectacular site of a total solar eclipse.